Hong Kong’s pro-democracy movement is likely to incur more resistance to reforms in the coming years after the recent defeat of a China-backed proposal for restricted elections in the city, analysts say. Nearly 50,000 people demonstrated in the streets of Hong Kong on Wednesday, the anniversary of the city’s transfer from British to Chinese rule in 1997. Democracy advocates say Beijing has failed to fulfill its promise to Hong Kong of sustaining a "one country, two systems" policy, whereby city residents would enjoy free elections and more civil liberties than the mainland. Pro-democratic lawmakers in Hong Kong’s legislature voted last month to block Beijing’s plan for the city’s elections, which sparked mass protests last year. The "Umbrella Movement"—named after the protesters’ use of umbrellas to shield themselves from pepper spray—captured global attention and renewed calls for democratic reforms in the financial center. While residents would have been able to elect their chief executive in 2017 under China’s proposal, they could only choose from a few candidates screened by a pro-Beijing committee. The electoral system now reverts to the status quo, in which a 1,200-member committee under China’s control selects Hong Kong’s leader. Turnout was noticeably smaller at Wednesday’s rally as democracy activists expressed uncertainty about their next move. 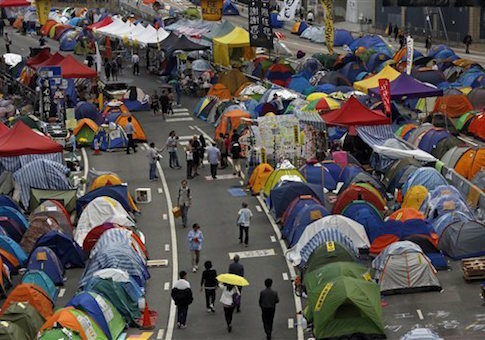 "Hong Kong people now have experienced the Umbrella Movement last year and are trying to think of other more progressive ways to express their views," Eddie Chan of the group Civil Human Rights Front told the Associated Press. Gary Schmitt, co-director of the Marilyn Ware Center for Security Studies at the American Enterprise Institute, said in an interview that Hong Kong’s democrats have few options to press their leaders in the city and in Beijing for more reforms. Hong Kong’s current leaders—who have close ties to China—have pledged to focus on economic concerns rather than political issues, and activists have said they will stick to peaceful, nonviolent protests. "In absence of something that might cause a crisis—which I don’t think [Hong Kong’s] democratic folks want to do—they’re kind of limited to picking their spots to remind folks about how Beijing has broken its promise when it comes to moving forward on political reforms," Schmitt said. "The other factor is whether or not the international community is willing to help in that process in delegitimizing what Beijing put forward," he added. Schmitt said the United States could exercise more influence by helping Hong Kong’s pro-democratic lawmakers organize with students, two like-minded groups that did not always appear to coordinate during last year’s protests. But U.S. officials have limited leverage in areas such as trade after China acceded to the World Trade Organization in 2001. President Obama has declined to publicly criticize China’s proposal for elections in Hong Kong, saying last year in Beijing that, "these are issues ultimately for the people of Hong Kong and the people of China to decide." A State Department spokesperson said in a statement that the U.S. government urges Hong Kong residents and authorities to "work together" to implement political reforms. "We encourage the Hong Kong authorities, Central Government authorities, and Hong Kong people to continue to work together towards the goal of achieving universal suffrage in accordance with [Hong Kong’s] Basic Law and the aspirations of the Hong Kong people," the spokesperson said. "As we have said previously, we believe the legitimacy of the Chief Executive would be greatly enhanced if the Chief Executive were selected through universal suffrage and if Hong Kong’s residents had a meaningful choice of candidates." In addition to China’s reluctance to accept democracy in Hong Kong, other recent actions linked to Beijing have raised concerns in Washington. New satellite images obtained by the Washington Post indicate that China has completed building several islands in the contested waters of the South China Sea, and is now moving to construct potential military bases with airstrips, helipads, and surveillance towers. Beijing’s island building heightens tensions in the region and could undermine freedom of navigation in some of the world’s most heavily trafficked waters, analysts say. Evidence is also mounting that China was behind the massive cyber attack on the U.S. government that compromised sensitive information for as many as 18 million current and former federal employees, according to reports. Schmitt said the traditional U.S. policy of inducing China to democratize through economic engagement, pursued by both Republican and Democratic administrations, "hasn’t produced the kinds of change in Chinese behavior that one predicted." With the United States and China closely intertwined on matters such as trade, the few options left to pressure Beijing are unappetizing, he added. "Perhaps our greatest leverage has really disappeared—now you’re left with very difficult decisions about how to beef up your military to deter positions of the Chinese military," he said. "We put ourselves in kind of a box that’s not all that attractive." This entry was posted in National Security and tagged China, Hong Kong. Bookmark the permalink.